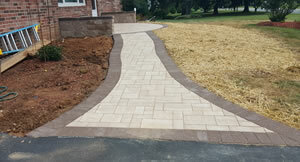 Ground Level Contracting is a family owned Hardscape business started in 1999. The company is based in Street Maryland and does work primarily in Harford and Baltimore counties. 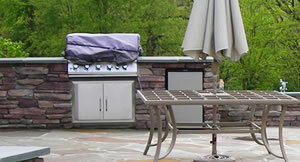 We specialize in custom designed flagstone patios and walkways. 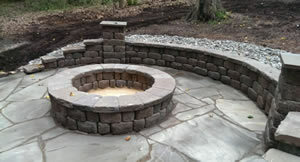 Other hardscapes include brick paver patios and walkways, retaining walls, steps, outdoor kitchens and firepits. 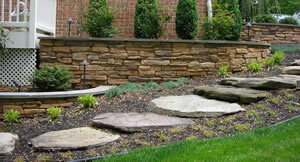 Other stone scapes may include boulders and stepping stone paths. 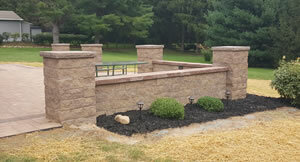 We provide custom designs or you can provide us with you own plans or drawings. 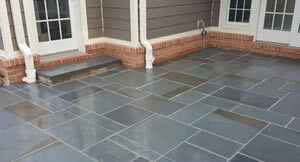 Some of the other services we provide are installation of drainage systems, maintenance of existing hardscapes, demolition of existing concrete pads, patios and walls, light excavation and stone and brick restoration. The owner of the company bids on all projects and is on the premise during all phases of construction.